People constantly manipulate technology without formal training but are not always able to explain what they know. Sometimes it’s almost like only the skater knows what’s going on with the board. As if to prove my point, the title of this video was written by someone who can’t even seem to label the trick. When I was a kid, wrapping the board around your foot like that was called an “impossible”. I originally encountered the clip on facebook with the trick labeled “front foot impossible craze”, making a total of three attempts to describe how Taylor Bray is spinning his body and the skateboard. Leverage. Most flip tricks start with an ollie, leveraging the board up into the air by tapping the end hard against the ground. Friction. The top of the skateboard has grip tape to increase friction and make it stick to the soft rubber sneakers. The bottom of the skateboard has wheels to make it roll back and forth but not slide as much side to side. This trick doesn’t play to much with sliding friction but tons of tricks play with the various levels of slipperiness and stickiness a skateboard offers. Potential energy. Bray is popping the board up with an Ollie but there’s also. A newer skateboard deck has “pop” which is basically when the wood is at its most springy. By kicking the board hard against the “ground”(in this case, the ramp), he can make the board bounce up into the air with him when he jumps. The more a skateboard is used it loses its pop. Gravity. That brief instant where he kicks the end of the board into the ground allows him to jump and escape gravity. An Ollie let’s him bring the board up with him. Gravity always pulls things down at the same rate, making it easy to estimate how much time Bray has to perform the trick. The subsequent slow motion shots of the same trick allow the viewer to analyze the trick but the first version in the clip shows how fast gravity pulls Bray back toward the Earth, giving him about one second to pull off the impossible. More rolling friction. When he gets the board in the air, he rolls it around his front foot. This trick was called an “impossible” when I was a kid in the 90’s but it’s basically wrapping the board around his front foot using rolling friction. Inertia. Bray is using inertia in several ways. He is using the speed he has to travel up the ramp against gravity. He’s using the direction the ramp sent him in to help him continue up into the air after the Ollie. Inertia comes into play in a few small ways while he is in the air manipulating the board with his feet. When he finally lands, he continues in the direction he was already going, and it is important that he points the wheels in the approximate direction of that momentum so his inertia doesn’t throw him off balance. Rotation. Bray is analyzing two different axises in quick succession. First he is rolling the skateboard around that foot in a move where the axis is outside the board itself, then he is catching it with his feet and rotating himself and the board on a vertical axis 360 degrees, landing in the same direction he was facing before the trick began. In the box above, I stuck to physics concepts. There are additional science concepts at work in this example, such as muscle memory, spatial cognition, coordination, time perception and sense of balance. A really common technical flip trick is the 360 flip. A 360 flip spins the board on 2 axises at once. In order to perform the move, a skateboarder has to conceptualize the simultaneous rotations before actually kicking them into place, and the rotations are often too complex for a layman to follow. The next age of enlightenment could require humans to quickly communicate complicated concepts despite only possessing an intuitive understanding. Consciousness and the human brain is a relatively young field of study. We are starting to understand what is happening in the brain when we perform complex physical tasks like a frontside 360 front foot impossible. Soon we might be able to identify the intuitive understanding of the related physics concepts and allow someone like Bray to access the verbal explanations of these physical principles as freely as he applies them to reality. In the 90's, a newer, more symmetrical skateboard design allowed for a new school of technical flip tricks. As designs do when they've reached near perfection, the new school skateboard changes within a very narrow parameter based on current trends in skateboarding - the design has plateaued. Skate tricks are a folk art that are learned from advice from peers and pros. The communication about how to pull off a given trick comes in the form of an esoteric language that changes over time. The names for new and developing styles of tech tricks are different in different social circles, evolve and change over time, and seldom utilize proper physics vocabulary. 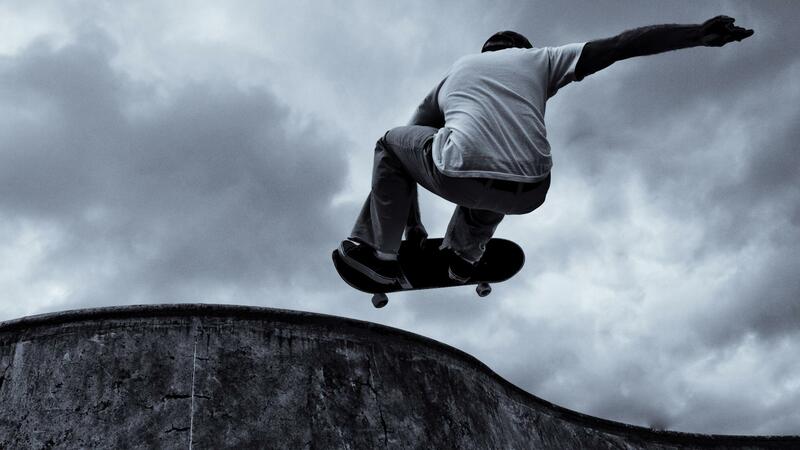 Skateboarding remains a great way to demonstrate intuitively understood, applied physics.